Your Bali Wedding has 2 offices; one in Seminyak, Bali and the other in Sydney. So you can rest easy that there is someone in Australia and a team of planners in Bali who are there with you throughout the whole wedding journey. Why choose Your Bali Wedding to plan your wedding? You will be dealing with Cindy who is from Australia and her team who have decades of experience in the event and wedding planning industry. Plus there is absolutely no language issues or barriers as we all speak English. All emails and enquiries will be answered quickly. We are super fast at getting back to people. Plus we are really good at what we do - even if we do say so ourselves! We have also been in the wedding industry in Bali since 2005 so you could say we are veterans at this. We know all the pitfalls and all the problems that could arise so we make sure that we have this completely covered. This means your wedding day will run smoothly, efficiently and without any dramas or hitches. Can I visit the wedding venue prior to the wedding? You most certainly can. All you have to do is let us know when your in Bali and if the venue is available we will do a walk through with you. Most of our wedding villas are close to Seminyak ( your probably staying in a villa or hotel in Seminyak already) so getting to our villas in Canggu, Uluwatu or Seminyak is really easy. A good idea would be to have a look at our wedding villas pages on this website, shortlist a couple of villas you'd like to inspect and let us know. We will organise an inspection for you while your in Bali. What are the best areas to get married in Bali? The choice is really up to you and will depend on the type of wedding you want. For clifftop weddings we recommend Uluwatu or Pandawa and for villa weddings near the beach we recommend the areas of Seminyak, Canggu or Nusa Dua. Obviously, this will be discussed with you when you chat with Cindy on your initial call, she has a wealth of experience in regards to the best Bali venues. You also need to take the time of the year into account and whether it's the rainy season or not. If it is a garden wedding might be preferable to a beach wedding. Having said that all our venues have cover in case it rains or it's too windy to hot. How quickly will you get back to me after my initial email? That day! We are really quick to respond to all email enquiries. It doesn't matter where your from: Australia, New Zealand, Indonesia, USA or Europe, we will get back to you. We can arrange a face to face video call if you prefer. We pride ourselves on being super fast with our response times and speedy customer service. Do you offer wedding packages with a fixed price? Yes we do. Remember, there are no nasty surprises, hidden fees or additional costs when get your wedding package through us at Your Bali Wedding. We are totally 100% transparent with everything we do. How much does a typical wedding in Bali cost? This can vary and it will depend on the number of guests, the area, the venue, type of villa villa as well as the type of wedding you want. Prices generally start at around the $10,000 mark and go up from there based on your requirements. Having said that, we will give you a fixed price once you complete the inquiry form (on the contact us page) & we get to know a bit more about your wedding must haves etc. Do you organise everything for the wedding? Yes we do. From photography, lighting, music, celebrants, venues, tables, decorations, florals, staff, table linen, hair, make up, food and alcohol right through to the transport, we will take care of absolutely everything. We leave nothing to chance and have everything covered off before the wedding day. You will be able to see all the panning that's going on behind the scenes, as we go about organising your wedding. This is done through our online real time wedding platform that we give you access to. It's absolutely incredible and allows you to be fully interactive with us (in real time) as we go about our job working on your wedding. Our Wedding and Events manager, Cindy is from Australia so we certainly speak English and our team of experienced planners are also English speaking. Do your wedding packages include all taxes and charges? Yes they do. Our Bali wedding packages are all inclusive so you will see all costs upfront. When we organise your Bali wedding there are absolutely no hidden fees or nasty surprises. Everything is quoted for in advance up front so you know exactly how much the wedding will cost to the cent! How many days should we come to Bali before the wedding? You will need to be here a couple of days at least before the wedding. This will give you ample time to settle in, relax and prepare for the big day. A good idea is to get a feel for the island, enjoy yourself, go for a tour or two and just enjoy the fact that the wedding and all the planning is being handled by a professional. Why should we trust you with our Bali wedding? Because we have been doing this since 2005 and have helped 100's of Australian couples get married in Bali. We feel that we have the depth of experience, focused customer service & local knowledge that not too many other wedding planners have. You will see from your first contact with us just how professional we are. Let us run you through our planning lounge to show you how collaborative and transparent the whole planning process is with us. To get started you can fill out the inquiry form or cal us directly. Can you shortlist your favourite wedding venues? 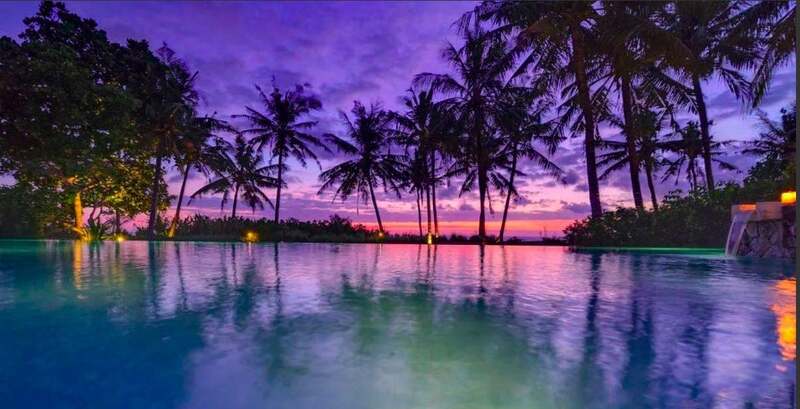 We have 4 wedding venues that we are more than happy to recommend: 1) Villa Shalimar in Canggu - if you want a beach style wedding in a fabulous villa. 2) Villa Bale Agung in Uluwatu - for a wonderful cliff top wedding with amazing views. 3) Villa Karang Saujana in Uluwatu - a gorgeous wedding villa on the cliff top. 4) Villa Eden in Canggu - for a garden style wedding in a private exclusive setting. You can view all our wedding venues & villas on our website. If you prefer you can speak to our head wedding planner who will be more than happy to show you our compete venue & villa list. Do you help with the honeymoon? Is what your paying for, a personalised service customised to your needs and vision? Yes it is. The fees are not only for the cost of the wedding venue, food, alcohol etc but you are also paying for our service as well as managing & managing the whole wedding for you. How many weddings have you planned in Bali? Literally hundreds. We have been doing this for well over a decade so the numbers are high. Is there a separate planning fee for additional services such as planning welcome dinners, recovery parties, hens/bucks parties etc? This will need to be quoted fro separately and you will need to discuss this with your wedding planner who will be able to put a quote together for you. Are you familiar with a variety of wedding vendors that supply consistency & quality in Bali? We meet loads of vendors all the time but we make sure that we use only the very best. We do this consistently so we can be assured that the quality is always there and that they are reliable, punctual and also represent good value for money. Who is the person to speak with direct in Bali if you have a drama pre-wedding? You always speak to Cindy, your wedding planner. She is your contact, lives and works for Your Bali Wedding & is your 'go to' person if there are any issues or dramas pre wedding day. Will your planner personally be present at your wedding? Yes she will. We make sure she is there at every wedding. What is your standard contingency plan in case of rainy / windy / hot weather? Bali does have wet and rainy seasons and we make sure that we are prepared for all contingencies in case there is rain or strong winds. More questions? Get in touch we’d love to help!